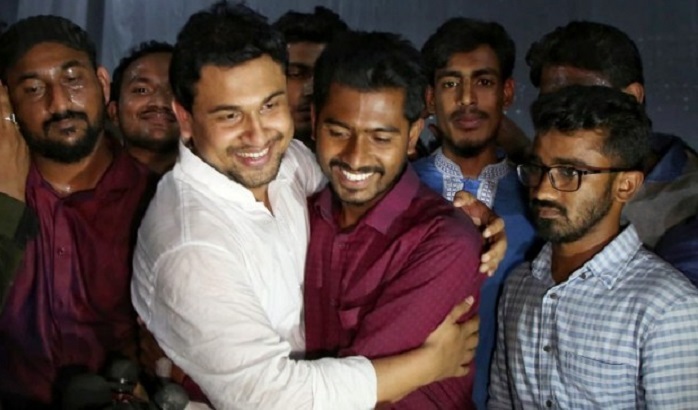 The Bangladesh Chhatra League (BCL) has welcomed Nurul Haq Nur, the newly-elected vice president of the Dhaka University Central Students’ Union (DUCSU) on Tuesday afternoon. BCL President Rezwanul Haque Chowdhury Shovon went to the Teacher-Student Centre and greeted Nur around 4:00 pm Tuesday in a bid to de-escalate tensions on the campus following Monday’s DUCSU elections. ‘The election has been accomplished. Nur has been selected as the VP. Now, He is the VP of all the students. I request both him and BCL men to show responsibility respectively,’ BCL president Shovon said. Nur edged out Shovon to become the vice president of DUCSU in the polls held after 28 years. Nur bagged 11,062 votes while Shovon polled 9,129.